When Sally and I bought Illusion in 1988, she was a wreck, having sat out of the water for 7 years with multiple bullet holes in the hull, no engine, broken rudder-tube, and part-time homeless folks living onboard. After a very busy two years with lots of help from Ron Moore, Bob Pearce, Alan Wirtanan, and Hap, we first raced Illusion in the 1990 Pacific Cup. We didn’t know it when we bought her, but Illusion turned out to be a well-known New York Yacht Club Cal40, originally owned by Bus Mosbacher and Vince Monte-Sano. There is a half-hull of Illusion in the NYYC model room apparently because Mosbacher/Monte-Sano won the NYYC annual regatta or cruise. Bizzy Monte-Sano visited Illusion when he was in San Francisco a few years ago and filled us in on lots of stories. Bus Mosbacher skippered Weatherly, sail number 17, in the America’s Cup, so Illusion’s original sail number was 1700. We did the normal upgrades to Illusion. 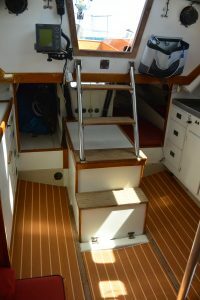 New Ballenger rig/boom, new engine, glassed the hull/deck joint, new rudder, faired hull/keel, new LPU deck/hull, new wiring, new deck gear, new chainplates, new electronics, and new sails. The only original sail that we occasionally use is a Ratsey and Lapthorne spinnaker staysail. Illusion remains a “class” Cal40 with all original dimensions. We bought Illusion in 1988 intending to go cruising, but old habits die hard so we mostly raced. We’ve raced Illusion to Hawaii 5 times. I set the singlehanded Transpac record in 1992. Sally and I won the Pacific Cup overall fleet in 1996, sailing doublehanded. We won class in the Transpac and 3rd overall in 2003 sailing with Cal40 legends Jon Andron and Skip Allan on our four person crew. Sally raced Illusion with a four woman crew in the 2005 Transpac and got 2nd in class. We’ve also won the Northern California inshore YRA series and the offshore OYRA series, and have competed in countless Farallon Races, singlehanded, doublehanded, and crewed, and won our share. We’ve found that Illusion is a terrific boat to race shorthanded, mostly because the Cal 40 has such “nice manners”. It steers terrifically under autopilot. That results in part from the fact that the Cal 40 doesn’t have a wide stern, and so doesn’t try to turn whenever it heels or rolls. 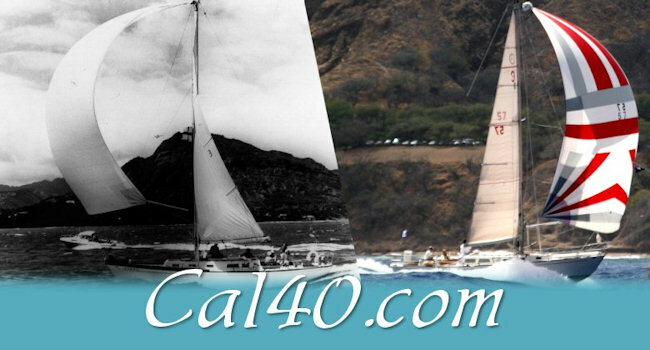 Of course Cal40’s are legendary in their ability to carry sail downwind, as seen in the photos below. In all of our Hawaii Races, shorthanded or crewed, we’ve never had to douse the kite for control, and the autopilot could steer at any time with the kite up. In 2014 we finally decided to give cruising a try and sailed Illusion to Mexico. We’ve been cruising Illusion in the Sea of Cortez and on the Gold Coast of mainland Mexico for the last two years. Sally and I were not sure that we’d enjoy cruising but we’ve had a terrific time. Part of the reason is that cruising is stress-free in a boat that we’ve raced so much doublehanded. The cruising community in Mexico thinks that we’re nuts the way we wait for high winds to set the kite and go downwind, and are willing to sail upwind in breeze. Illusion 1993 Doublehanded Farallones Race 1st in class passing under Golden Gate Bridge returning from the Farallones. We use a Lavac head, which we’ve found to be trouble free. The Lavac head uses a standard Henderson diaphragm pump. We added some PVC plumbing and valves on the input side of the diaphragm pump so that we can also use it as a backup bilge pump, to pump out the floor of the head if we use the hand-shower, or to empty the holding tank. This entry was posted in Cal40 on August 27, 2016. We cut out the original Cal 40 hatches and glassed in short pedestals that are about 2 inches high at the outboard edges and absolutely flat on the top. We then installed Lewmar hatches on the short pedestals. They have been perfect and leak free for 28 years. We lubricate and clean the rubber seals every few years with some silicone grease. 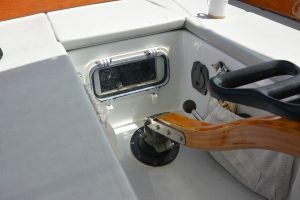 The varnish on the top edge of the cockpit coamings on Cal40’s never lasts long because folks sit on it, step on it, drag lines over it, and hit it with winch handles. We borrowed an idea from Lin and Larry Pardey and put a top piece of brushed teak on the top of the coamings. The bit of brushed teak on the top is slightly wider than the coamings, which makes it more comfortable to sit on. It also makes it easier to not get varnish on it because the proud edge of the brushed teak holds the edge of the varnish brush when you’re varnishing the coamings. That bit of brushed teak needs no maintenance, the color looks fine with the varnish surface next to it, and it saves tons of wear, tear, and work. Bob Pearce built this table for us. It is removable for racing. It is terrific for cruising. The normal Cal 40 table tended to be in the way. It folds up out of the way against the main bulkhead. It can be used either in a single width mode or doublewide. It is held up by a spectra line. If Sally sets up her sewing machine on it we have a removable foot to hold the table up because the spectra line would be in the way. This entry was posted in Cal40 on August 26, 2016.
jib hanks, reefable solent jib. We use hanks on Illusion. We like the ability to change headsails easily. Shorthanded it is also nice to be able to just run the jib halyard and not worry about anything going wrong. This is a helpful ability either in a squall, or in a spinnaker set. 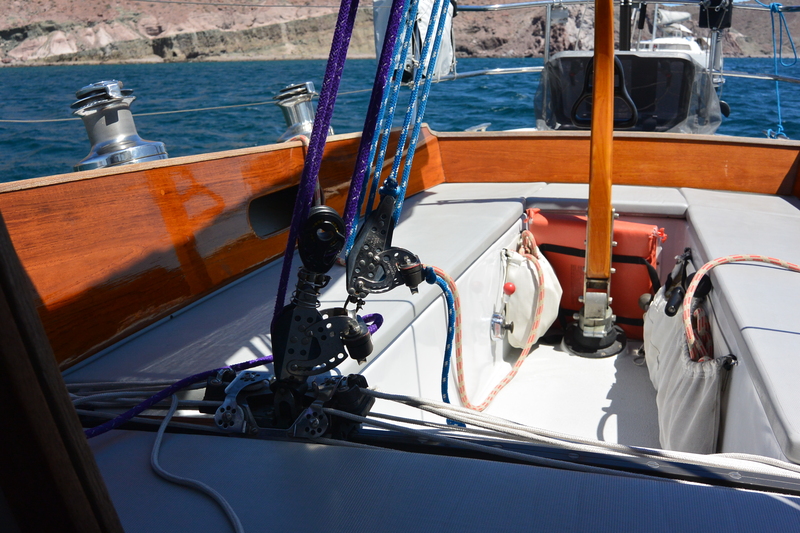 When you’ve got time you can pull the jib out of the bow wave and onto the deck. In the old days when Cal 40’s were used for the Congressional Cup, with full crews and hanks, we did the same thing. At the weather mark the mastman would just run the jib halyard and let the jib just sit on the bow wave. The first crewman available after the set would later pull the jib out of the bow wave, over the lifelines and onto the deck. Racing Illusion singlehanded on Farallon Races I would always gain on my competitors when we passed Point Blunt and had to change from our #1’s to #3’s. 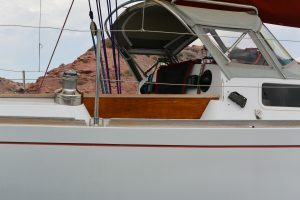 I’d do a bald-headed change, but I’d already have the new sail hanked on under the old one, so I’d just have to drop the old sail, tie it to the deck, unhank it, move the halyard, and hoist the new sail. 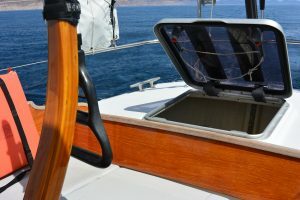 At no point in the process was there any risk of losing control of a sail or having a sail blow out of the luff groove. Meanwhile the guys trying to change a luff groove genoa by themselves were having a very difficult time, and the guys with roller furlers had a hopeless sail shape once furled and were out of the race. We don’t see many boats using hanks any more in the cruising fleet, but it works great for us. 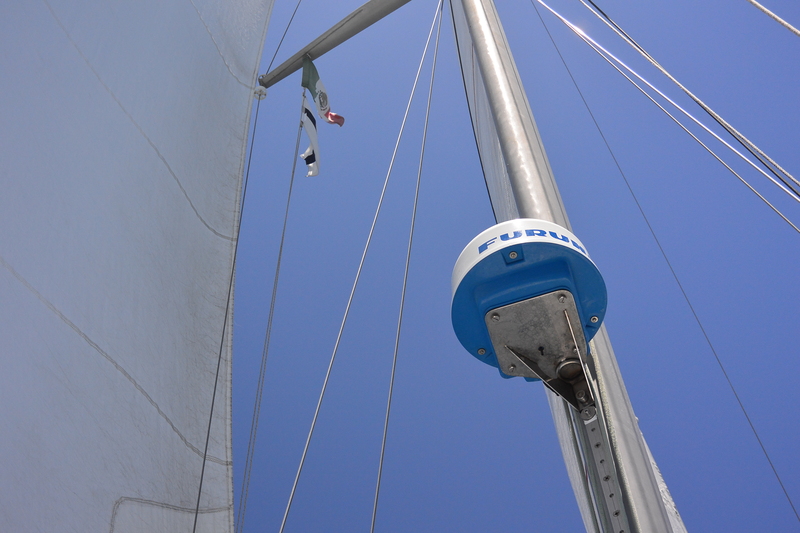 On Illusion for cruising and deliveries we use a 125% reefable solent jib, and keep it on deck in a jib bag when at anchor. We didn’t invent this sail. I first ran across this idea when I delivered the Cal 40 Whisper back from Hawaii after the 1975 Transpac. I credit the Brauch’s for inventing it although Whisper’s solent jib used reefpoints instead of a zipper and tended to hold water in the reef. The jib has two tacks and two clews. 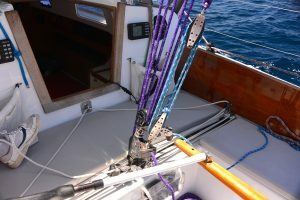 To reef the jib you temporarily drop it on deck, roll the foot up, run the very heavy zipper which encloses the rolled up foot, change to the new tack and clew, and rehoist. The jib goes from a 120 to a short hoist 100. Having the reefed foot enclosed in the zippered pocket keeps any water from accumulating in the folds of the reef, which can happen if you use reef points. 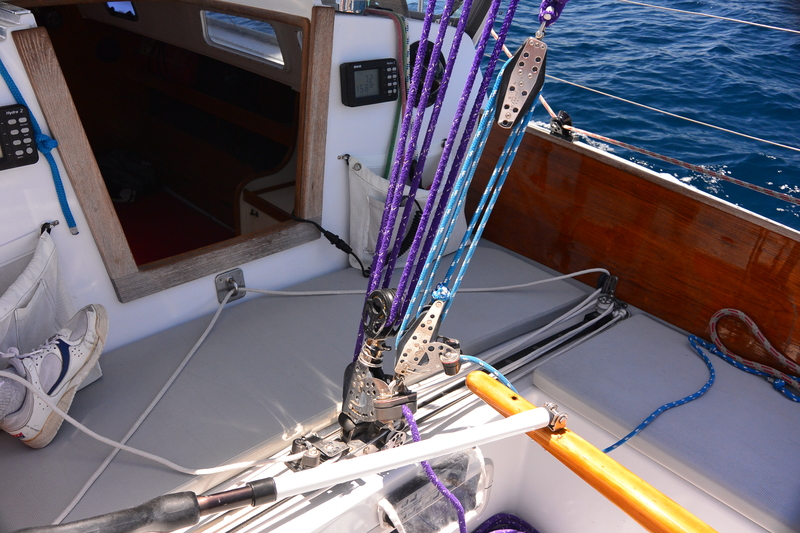 Reefing the jib has a number of advantages. The sail has a perfect shape both when reefed and unreefed. We are able to carry one fewer sail. For racing upwind, however, we use a #3. We do use the highcut, reefable 125% as a blast reacher in Hawaii Races. Illusion has her traveler on the aft edge of the bridge deck, which is unusual. 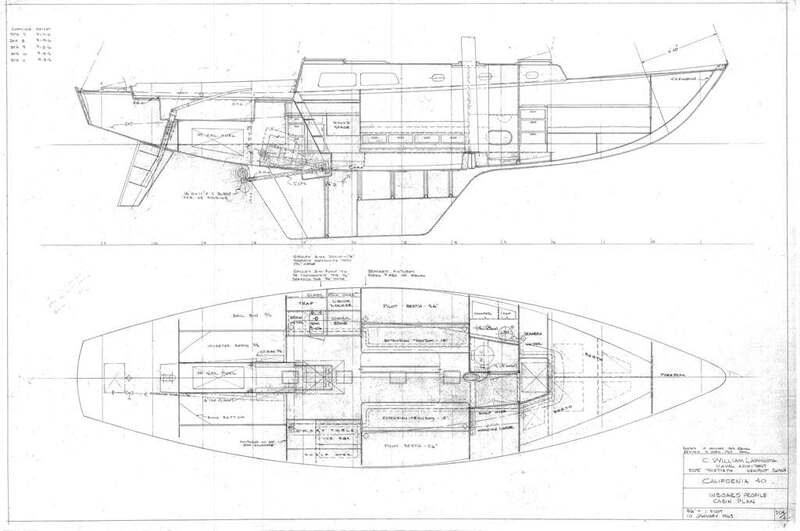 Interestingly, George Griffith mentioned that this is exactly where he intended for the traveler to go on Cal 40’s, but after sailing Persephone, he found that with a full crew it got too crowded in the front of the cockpit. 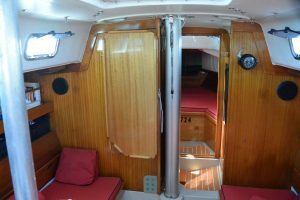 Also, he originally intended the primary genoa winch to be the after winch, which is why the aft end of the winch islands is wider, but he quickly discovered that Cal 40’s don’t like weight aft. So nearly all boats moved the traveler aft, and the primaries forward. On Illusion, however, we mostly race doublehanded, so we don’t have a crowding problem. We have a 6:1 with 24:1 fine tune mainsheet that can be trimmed directly from the ratchet block and doesn’t need a winch. When doublehanded or singlehanded it is terrific to be able to steer, and adjust both main and traveler. Also, having the traveler farther forward allows it to be effectively used at somewhat wider angles close reaching. 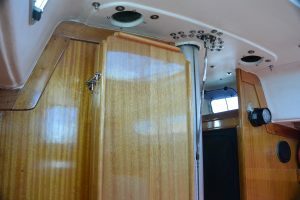 Illusion’s pilot berths have been replaced with shelves, and the faces that holds the drawers adjacent to the settees have been moved outboard about 8 inches. The settees are fixed and do not slide. 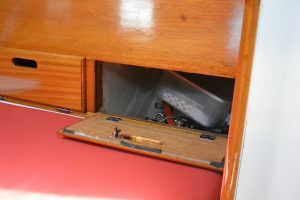 Given that we didn’t need the space for the settees to slide under the drawers, we removed the drawers and used the old drawer faces as hinged cabinet doors. 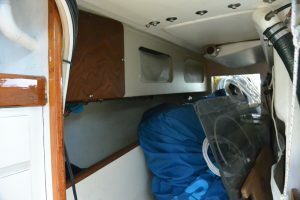 There is now a longitudinal bulkhead that extends from the drawer faces down to the hull, and between each cabinet there is a small athwartship bulkhead that separates the cabinets and is also glassed to the hull. This has made the middle of the boat very rigid. Under the gunnel outboard of the quarterberths we installed storage lockers. Those panels also have stiffened the boat. the forward most locker is a vented propane locker that has a removable, gasketed panel (varnished) that is used to remove the tanks to fill them. We carry two 20 lb, aluminum, horizontal, propane tanks, one on each side. 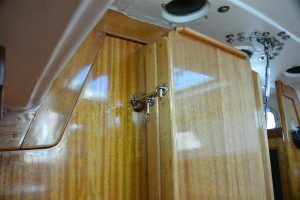 The tank compartments are vented to the thruhull that is above the water line just below the propane locker that is also used to drain the cockpit seats. We have a removable propane Cozy cabin heater which explains why we can carry two tanks. 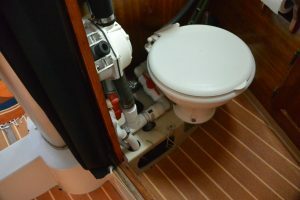 Strictly speaking, this propane installation does not meet ABYC because propane lockers are not supposed to open into the interior of a boat. Whenever Illusion has been surveyed, however, every surveyor has noted that the installation is not precisely compliant with ABYC, but it is safe, the lockers are airtight and vented outboard, and that they would have done exactly the same thing if they owned the boat. We’ve never had an insurance company complain given that the survey says it is a safe and sensible solution. We wanted the porthole in the forward end of the cockpit well to be usable for light and ventilation, so we put the engine controls behind a Beckson porthole in the aft end of the cockpit well. 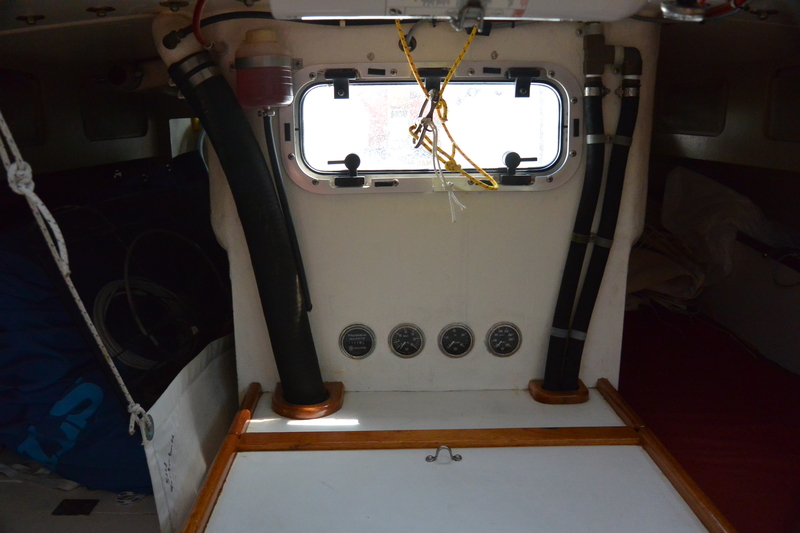 The Beckson porthole allows the engine controls to be entirely waterproof in heavy going when filling the cockpit with water. We found that by using a barrel nut as the knob, we could even fit the engine kill cable in the panel, behind the Beckson portlight. When cruising or delivering the boat we carry a removable radar. We have a modified car that just slides up the spinnaker pole track, and carries the radar scanner. The wire pulls up the mast on a leader and exits near the scanner. The scanner is mounted on the car so that the edge of the scanner just touches the pole track. The scanner has to be rotated a bit so that the cable gland is out of the way. It is easy to configure the software to handle the twisted installation so that straight ahead on the boat is straight up on the display. 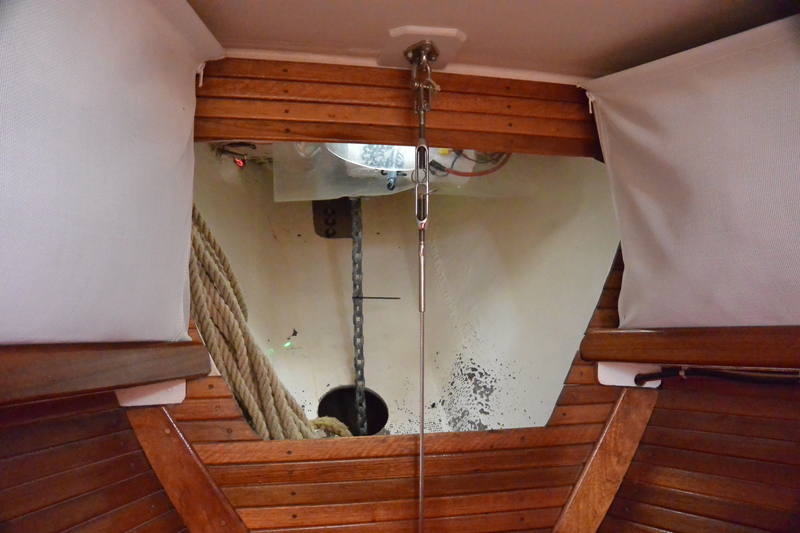 The radar display is on a pivot hear the companionway, so that the radar display can be pivoted to be viewable from either on deck or below. When racing everything comes off, the scanner, display, and cable. Illusion has a removable staysail stay. 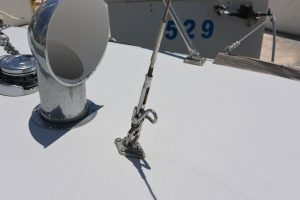 The staysail tack fitting is one third of the way aft from the stem to the mast and the staysail stay, when set, runs parallel to the headstay. That is all pretty conventional. The staysail tack fitting has identical pad eyes above and below the deck, with a G10 backup under the deck. 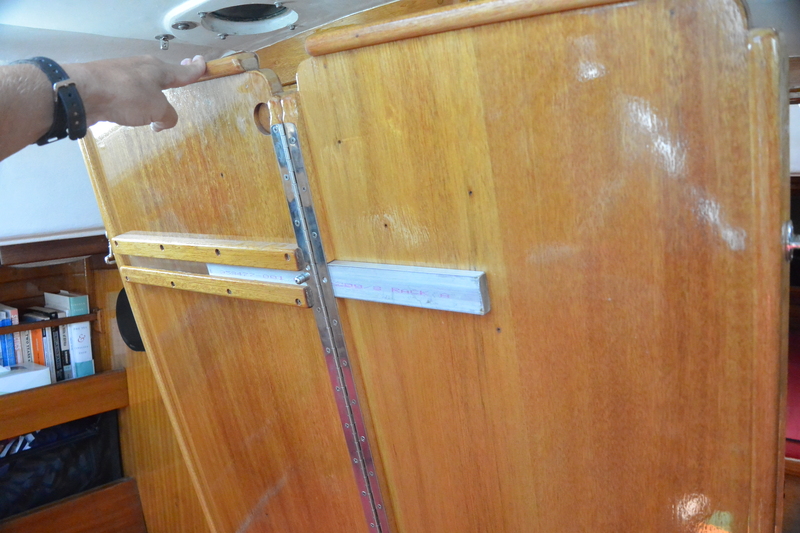 There is a tie wire with turnbuckle below deck. We tension the stay with a half-Navtec turnbuckle above deck, that is allowed to twist due to the swivel on the Tylaska snapshackle. 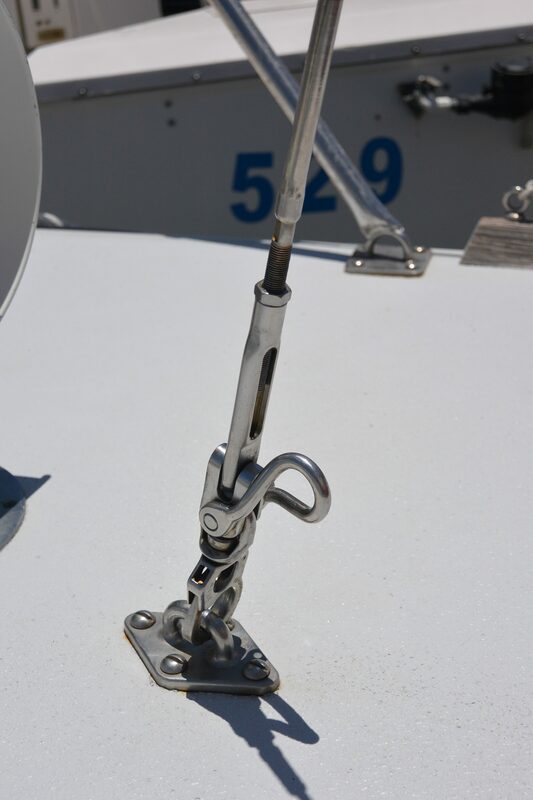 There is a twist shackle used to attach the tack of the staysail. 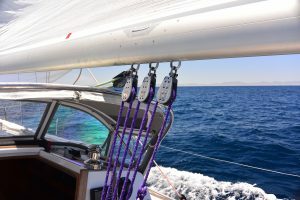 We used the half-turnbuckle on a snapshackle approach so that the hanks on the genoa staysail can slide nearly all the way down to the deck. We sometimes keep the staysail hanked on the staysail stay, in a bag, when it isn’t being used so it is very nice that the staysail can slide down close to the deck. 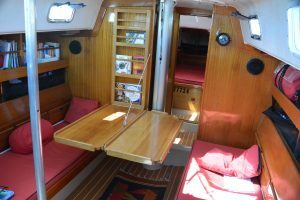 Our genoa staysail is made very heavy and serves both as a genoa staysail for doublehead reaching on the first 2-3 days of the Hawaii races, but also serves as our heavy weather jib for beating in over 30 knots. It’s size allows it to count as the heavy weather jib under the OSR’s. 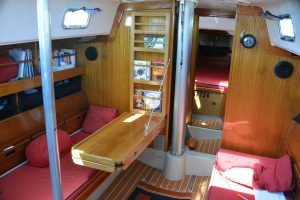 We carry the genoa staysail along with a double or triple reefed main in above 30 knots upwind. 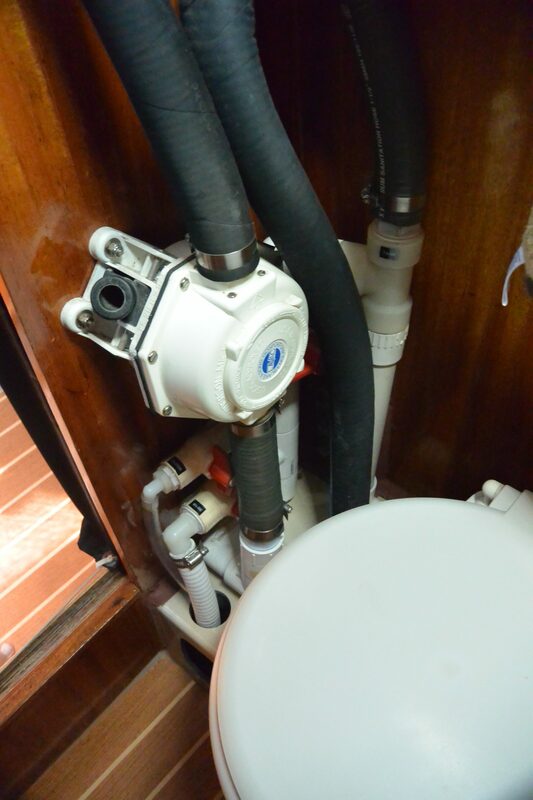 We’ve carried it up to about 42 knots with a triple reefed main, which is pretty much the top end of that combination. Our removable running backstays attach via T-tangs in the vicinity of the removable staysail stay, which is also attached with a T-tang. For inshore racing we remove the runners and the staysail stay. Just below the staysail stay T tang is our topping lift exit. We have a somewhat heavier than usual topping lift and sheave, that we use as the staysail halyard as well as for a topping lift. Once the kite is up we disconnect the staysail stay and lash it aft. Of course it has to be stowed aft for dip pole gybes. Beating, in 30-40+ knots, a Cal 40 balances perfectly under a staysail and reefed main, better than if one uses a storm jib or heavy weather jib set on the forestay. We have kept the normal Cal 40 forward lowers. 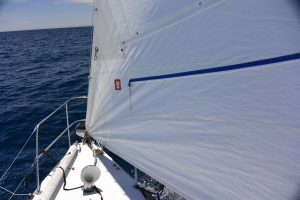 They reduce the mast pumping when sailing upwind in heavy air, but for long beats like Hawaii to Alaska or Hawaii to California, it is nice to set the staysail stay and running backs. With that gear set the mast does not pump at all.